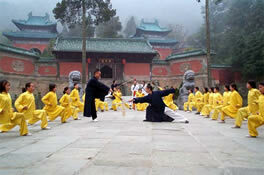 Wudang Kungfu, one important school of Chinese martial arts has a very long history. Wudang Kungfu, incorporating ways to stay healthy and prolong the lifespan as well as collecting the skills to fight, is not only a special school of martial arts, but also a whole system of martial arts theory. Wudang Kungfu, as a culture, takes root in the fertile soil of thousand-year long Chinese civilization, containing profound Chinese philosophical theories, combined with the traditional notions of Taiji, Yinyang, Five-element, Eight-diagram into boxing theories, boxing skills, exercise and attack policies, tantamount to studying the laws of life activities. So we can say that Wudang Kungfu is the crystallization of Wudang Taoism in the process of studying life. It is said that Zhang San-feng, the founder of Wudang Boxing, was self-cultivating in Wudang Mountains, when he witnessed a fight between a magpie and a snake. That the magpie was flying up and down to attack and the snake was shaking its body and raising its head to fight back gave him inspiration and understanding of the Taiji theory so that proceeded to create Wudang Internal Kungfu. The original legend of Wudang Kungfu, and the pose of the snake in the fighting have visually demonstrated the gist of Wudang Kungfu: to overcome the strong in a gentle way and to win by striking only after the enemy had struck. To ascertain one's position and then defeat the enemy. After many boxing masters' enrichment and development, Wudang Kungfu has many derivative schools and kinds, such as, Taiji Boxing, Form-and-will Boxing, Eight-diagram Palm, Taiji Sword, Lightening Kungfu, Hard Kungfu, feats and variations of Qigong. From then on, Wudang Kungfu has walked out of the deep mountains and become an important school of Chinese martial arts.